Yesterday I was at the movies and watched Alice in Wonderland by Tim Burton. I loved it! The colors were so nice and inspiring. The mad hatters tea party got me in the mood to create a scene with miniature things I had at hand. Tables and chairs. Books and nick knacks. I also got the opportunity to display some of my teapots. After all this is a tea party and wouldn't be completed without it. If you like to make your own teapots and need some guidance I have several tutorials on my YouTube channel. If you know me I am also happy to show some of my baked goods. The mad hatter, Alice and the animals are not present. I my mind they just haven't arrived yet or who knows maybe they just left;) Have you seen the movie and did you like it? Christel your little scene is perfect. I love how you've laid everything out. Brilliant. So nice. This scene is very inspiring. My goodness; this scene is so charming! I love the mismatched chairs and whimsy of the grassy setting. Too precious! What a great scene! I love this style. I love it ... this is so beautyful. What a great idea and a lovely little scene - I like the chair that's been knocked over, as if someone has just rushed away. What a wonderful scene Christel! I love the lace and all the pretty chairs you used. If I look at the upset chair, I think they all left in a hurry... what a pity because the cakes look so appetizing and they haven't even tasted it! It´s a wonderful scene.Congratulations. Hugs,Matilde. Oooooh That is just wonderful! I still have to see that movie. I am glad to hear you liked it. It didn't have great reviews. Å, noe så flott, helt eventyrlig! Ohhh Christel.... die Tafel ist wunderschön arrangiert und lädt ein, sich dazu zu setzen. Ich war auch schon in dem Film und fand ihn wirklich bezaubernd... auch wenn es ja eigentlich ein Kindermärchen sein sollte. The scene is wonderful, I am wishing that the movie has the premiere in españa, but even we will have to expect a few days. la escena es maravillosa, estoy deseando que la pelicula se estrene en españa, pero aun tendremos que esperar unos dias. Has recreado la escena de maravilla, con todos los detalles, tus teteras son una preciosidad. This little scene is amazing, it really feels as if you've snapped a picture from alice in wonderland's world! I really like it! So beutiful, I love that You took the picture outdoor, It so realistic! What a gorgeous little scene Christel. All perfectly put together! I wish the movie arrive to Spain,the next week i will go to see it!! This is just amazing and such a great idea. Thanks for telling us about where to find info on teapots. I would love to try. Oh it looks amazing Christel!! I liked the movie's story but LOVED the pictures. 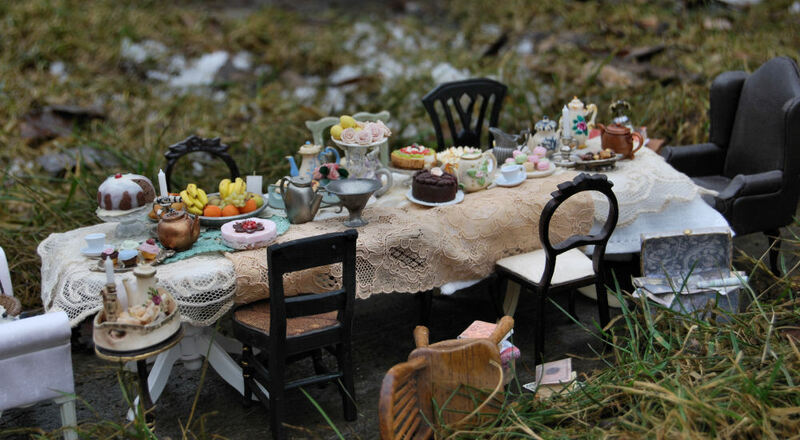 I too want to make the tea party scene one day but I doubt it will look as good as yours!! Christel, what a fantastic little scene! It looks as though the tea party was a success!!! What a beautiful scene! I can't wait to see the movie. Que escena mas bonita, su realismo es fantastico Christel !!! I saw the movie and thought it was boring. But I will say it was a visual treat such as your rendition of the tea party here. It is uber fantastic! Christel, I wish you can hear my applauses!!! Is perfect and you said you made it with the things you had!!! Incredible how outstanding the scene is!! Congratulations for a work so well done!! I love your scene, it's perfect. Mmmm... all look so delicious...!!! Great work, as always, Cristel!!! Nydelig sammensatt med mye fint . Håper du har hatt en fine påske . Such a fabulous little scene, I looked at these photos over & over, all the items are amazing. To think you could just come home from watching a movie and then create this from items you had to hand....wow! That is fabulous!!!! So perfect, I love the movie too, so inspiring. I would just love to be coming with Alice to your table. Love your Alise in Woderland scene! This is such a remarkable little vignette! I love how it looks like it was the middle of something going on--and the fact that you took the photos outside. What a nice scene !!! Jeg finner bloggen din veldig hyggelig!! amazing Christel, a great display!!! Christel, I have an award for you on my blog. You truly deserve it. Simply stunning, Christel!!! I love the way you laid everything out on the long table and it all looks so sumptuous! Truly, a fantasy meal!! Whipping får du tak i, på Coop o mange andre matbutikker. Datteren min tåler ikke valig fløte, så da er dette et godt alternativ. Christel, I'm absolutely head over heels for this scene! I did one too, and one of the comments mentioned your scene, so I had to come see. It's perfect!!!!! I love your mini style! This is so adorable! Love anything that deals with Alice in Wonderland! Stunning and inspiring creative work!